Munich - FC Bayern München are cruising in the league in 2013/14, so it is no real surprise that the player of the week vote goes toward one of their many high-performing stars. has only played 11 games this season due to injury, but he has won every one, becoming the only player in Bundesliga history to have won his first 11 games in Germany's top flight. However, it was his performance in FC Bayern München's 4-0 victory over Hannover 96, the latest in a string of impressive displays, that made him our users' standout player on Matchday 22. An impressive 51 per cent of bundesliga.com users believed Thiago's performance deserved the post-matchday award after another imperious display, this time in an unconventional left midfield position, where he helped himself to another goal, his second of the season, and helped extend Bayern’s unbeaten run in the league to 47 games. He was not the only player to impress on Matchday 22, though. Goalkeeper Raphael Schäfer came in second (25 per cent) for his two superb penalty saves in 1. FC Nürnberg's 2-1 win over Eintracht Braunschweig. The victory was der Club's fourth in five games and lifted them from 14th to 12th in the league table, four points clear of the relegation play-off place. 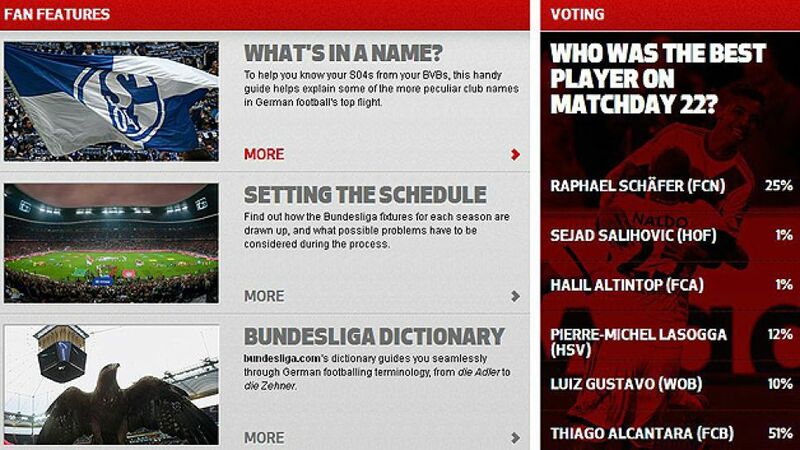 In third place, with 12 per cent of the vote, was Hamburger SV's Pierre-Michel Lasogga. The 22-year-old grabbed a goal and his first assist of the season in their stunning victory over Borussia Dortmund at the Imtech Arena. The German is looking on form scoring 11 this season after only 16 games and could be a key to die Rothosen's survival in Germany's top division. Luis Gustavo of VfL Wolfsburg also reached double digits (ten per cent) as he scored the second goal in their 3-1 win over second-placed Bayer 04 Leverkusen, while both Halil Altintop of FC Augsburg and Sejad Salihovic of 1899 Hoffenheim received one per cent of the vote, despite both scoring extremely influential goals in their games against SC Freiburg (4-2) and Borussia Mönchengladbach (2-2) respectively.